The following is an excerpt from Karl Marlantes' What it is Like to Go to War (highly recommended reading, thanks to Captain Jack for the tip). 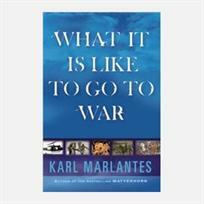 Marlantes is an American Combat Veteran who fought in Vietnam. This passage gives another perspective on "holy war," something I've been thinking about since my trip to Mleeta. Particularly interesting is Marlantes' suggestion that embracing a spiritual aspect to combat mentally prepares and protects soldiers from trauma, and helps with reintegration and return. This makes a lot of sense, as much of the work in psychology around trauma seems to have to do with constructing a personal narrative which gives meaning to our otherwise random suffering. In a way, it makes sense that the more painful the suffering, the more profound the meaning must be in order for us to accept and integrate the traumatic experience into our life story. "Many will argue that there is nothing remotely spiritual in combat. Consider this. Mystical or religious experiences have four comon components: constant awareness of one's own inevitable death, total focus on the present moment, the valuing of other people's lives above one's own, and being part of a larger religious community such as the Sangha, ummah, or church. All four of these exist in combat. The big difference is that the mystic sees heaven and the warrior sees hell. Whether combat is the dark side of the same version, or only something equivalent in intensity, I simply don't know. I do know that at the age of fifteen I had a mystical experience that scared the hell out of me and both it and combat put me into a different relationship with ordinary life and eternity. Most of us, including me, would prefer to think of a sacred space as some light-filled wonderous place where we can feel good and find a way to shore up our psyches against death. We don't want to think that something as ugly and brutal as combat could be involved in any way with the spiritual. However, would any practicing Christian say that Calvary Hill was not a sacred space? Witness the demons of Tibetan Buddhism, ritual torture practiced by certain Native American tribes, the darker side of voodoo, or the cruel martyrdom of saints of all religions. Ritual torture or martyrdom can be either meaningless and terrible suffering or a profound religious experience, depending upon what the sufferer brings to the situation. The horror remains the same. Combat is precisely such a situation. Our young warriors are raised in possibly the only culture on the planet that thinks death is an option. Given this, it is no surprise that not only they but many of their ostensible religious guides, like the chaplain with the booze, enter the temple of Mars unprepared. Not only is such comfort too often delusional; it tends to numb one to spiritual reality and growth. Far worse, it has serious psychological and behavioral consequences. To avoid, or at least mitigate, these consequences, warriors have to be able to bring meaning to this chaotic experience, i.e., an understanding of their situation at a deeper level than proficiency in killing. It can help them get through combat with their sanity relatively intact. It can help them from doing more harm than they need to. It is also a critical component in their ability to adjust when they return home."